Wedges - These just look like summer and they are so unique. Not to mention a decent price! 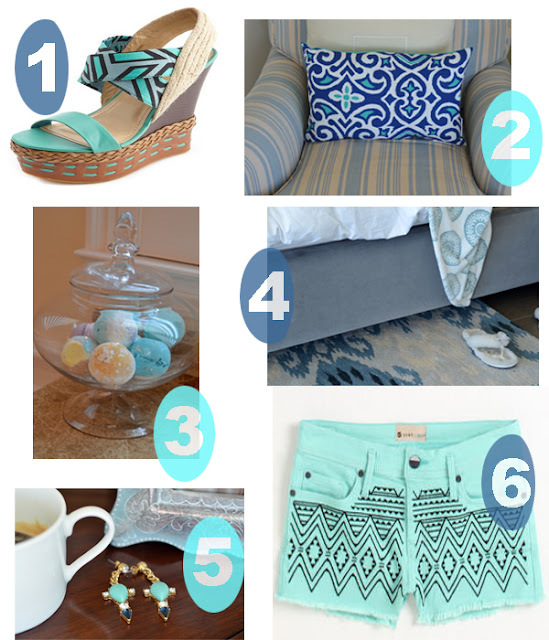 Aqua/Blue Pillow- I just bought two of these and they are now living in my master bedroom, I love them! Spike Earrings - I snapped a pic of my club monaco earrings chilling next to my coffee...2 of my favprite things! Cut-Offs -If I werent a mom, maybe I'd feel more comfortable rocking these cute cutoffs, maybe when my thighs shrink to pre-baby day size...maybe not, but i still love these shorts! I love blue! this looks so pretty!